the final preparations for the 2018 MV Challenge are in progress. Not much longer, now. 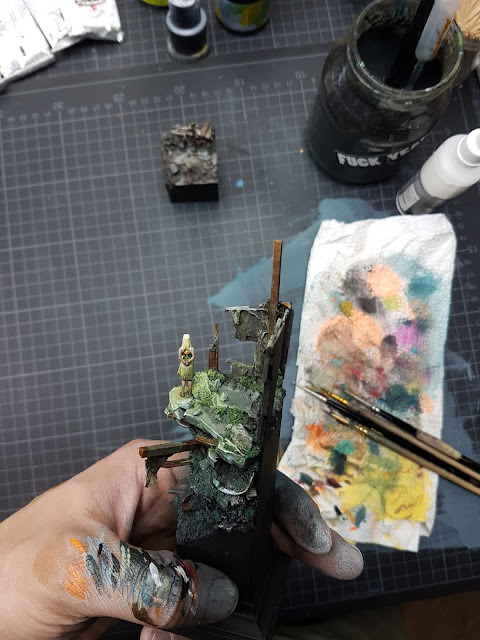 While I am working on this and heading towards teaching another one of my well known Beginner Classes to spread the word and knowledge about #happypainting over the upcoming weekend in Augsburg to a big group of students I got something dropping in the jungle that flew all the way from Australia. We hope you will enjoy the article and we give big thanks to Trent for his great help! If you want to read more of these be patient and stick to your jungle. Hello from sunny Brisbane, in Australia! 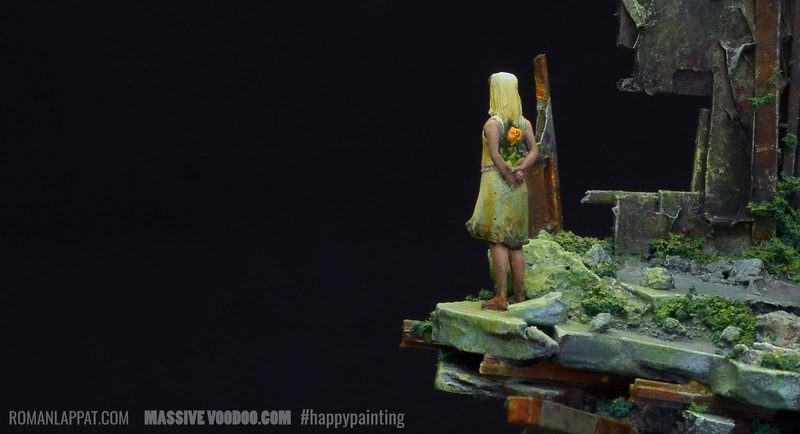 I feel very fortunate to be able to contribute to Massive Voodoo, a blog that has inspired and assisted me in my journey as a painter, and am very grateful to Roman for the opportunity. 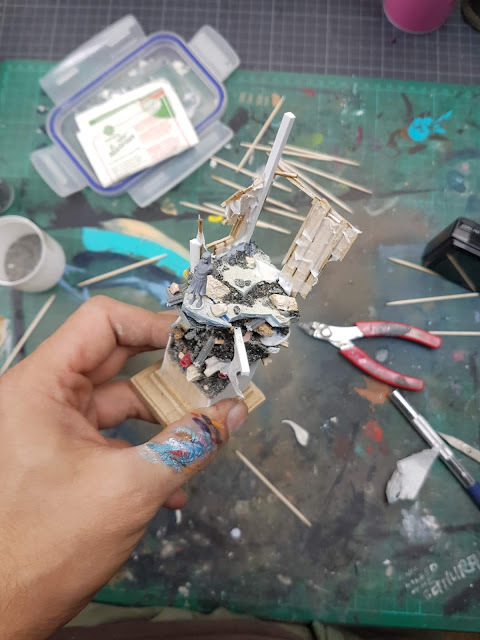 Whilst I certainly am not anywhere near the same level as some of the other incredible painters who feature on this site, hopefully I can add some value in showcasing some of the techniques I use that allow me to paint models very quickly. 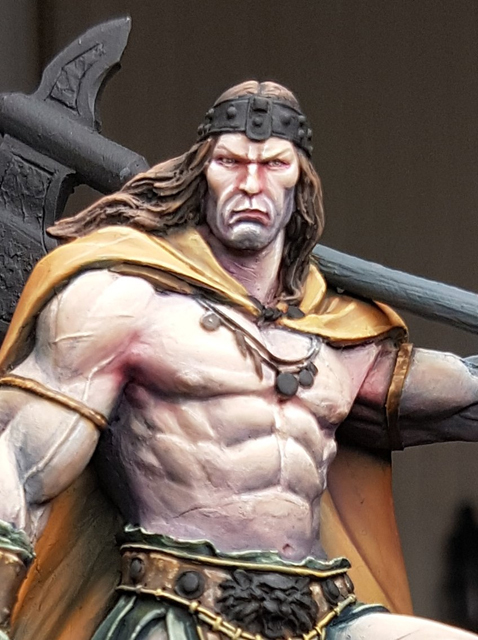 In this article I will be doing a step by step breakdown of a model I painted a little while ago, the Barbarian King by Joaquin Palacios Studio. 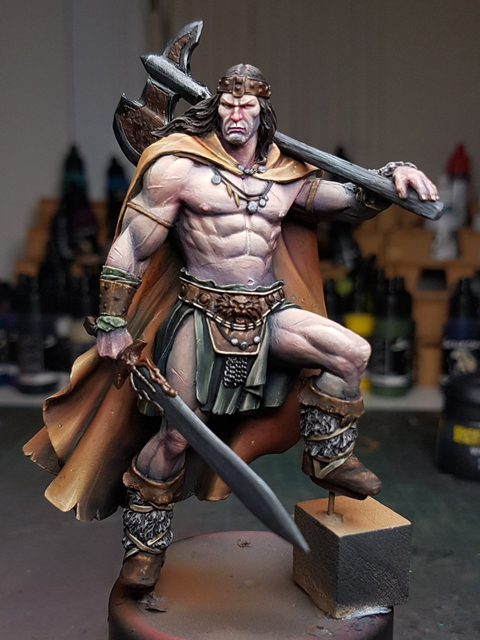 This is a wonderful piece, Conan is such a recognizable and powerful presence, and I wanted to paint it as well as I could to reflect that! I buy models all the time that I find inspiring. Unfortunately, sometimes they sit on my shelf; I lose interest in them for whatever reason, or aesthetically I've found something similar that I enjoy more. Occasionally I buy a model and when it arrives I dislike the sculpt. But usually when I buy a model and it turns up I get super excited and put it on my shelf of models to paint. I decided one day to paint this piece, so I knocked it together and had a think about it. 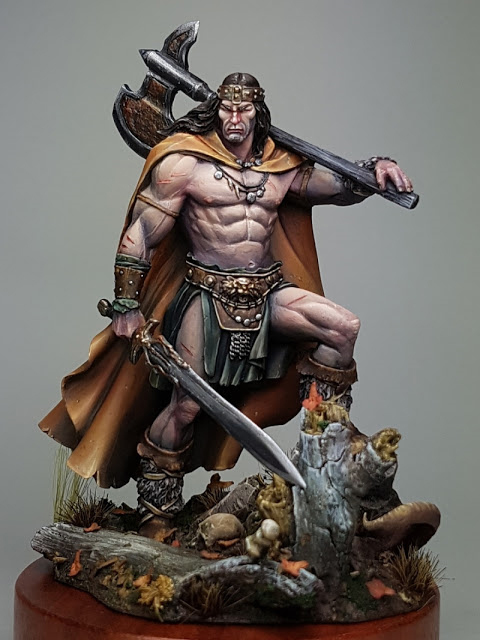 It reminded me of old school pieces of artwork from like Frank Frazetta and Boris Vallejo, guys whose artwork made my eyes boggle when I was a young lad. 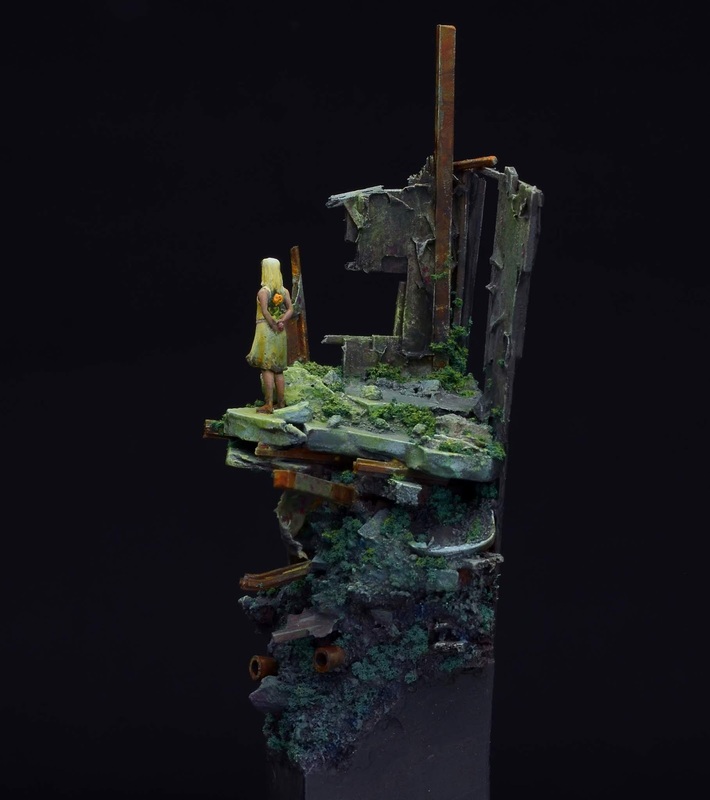 I have been aiming to push myself more and try more difficult techniques on each piece, and this model felt like a good chance to try painting something that was in a similar vein to their artwork: vivid, full of colour and depth and atmosphere. Or at least, I would try to replicate that! 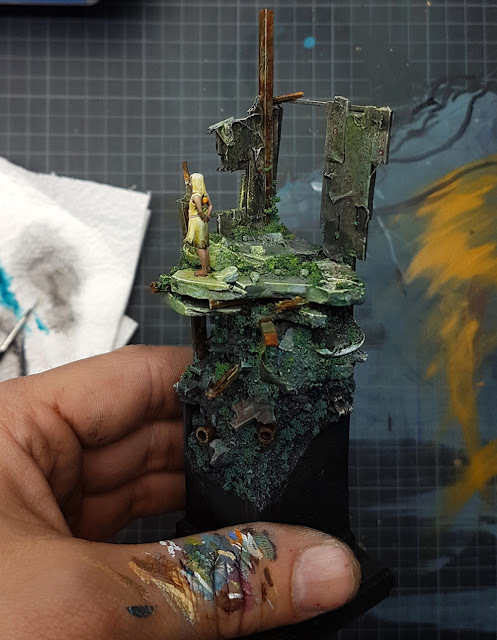 I began by working on the base. I have a lovely wooden plinth from a local in Brisbane called Jim that I planned to use for this guy. 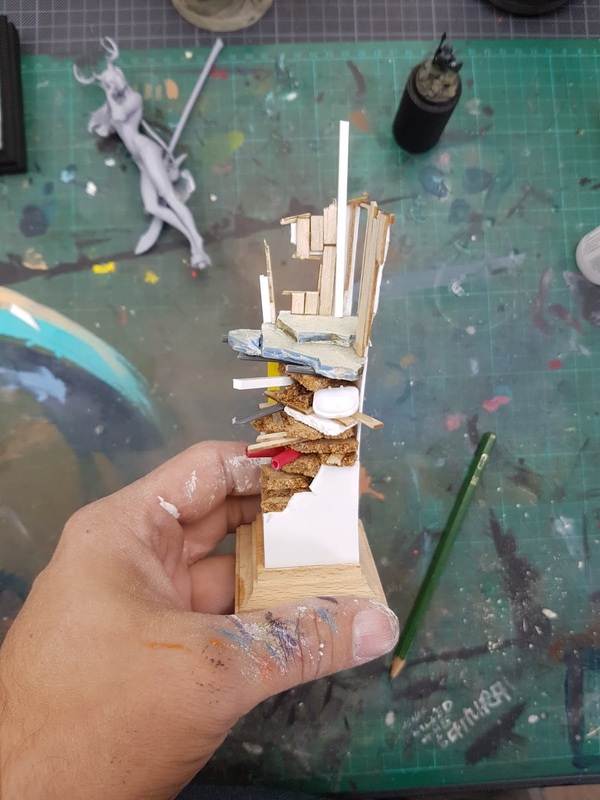 I didn't want to risk getting any sand or paint on the plinth, so rather than masking it off, I used a plasticard base to use as the surface for everything, with plans to glue it to the plinth after it was finished. 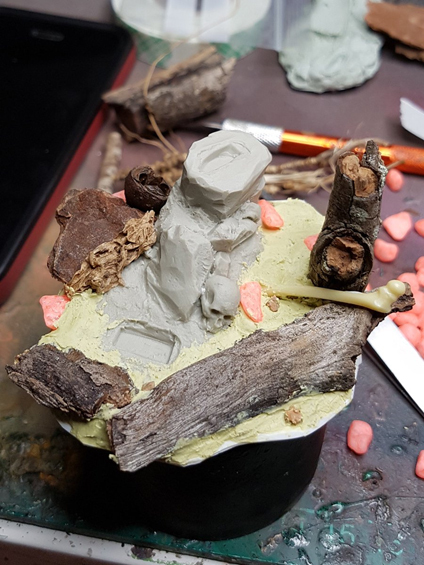 I've glued the original rock structure that comes with Conan in the centre, and added various bits of forest and debris to the surrounding areas. 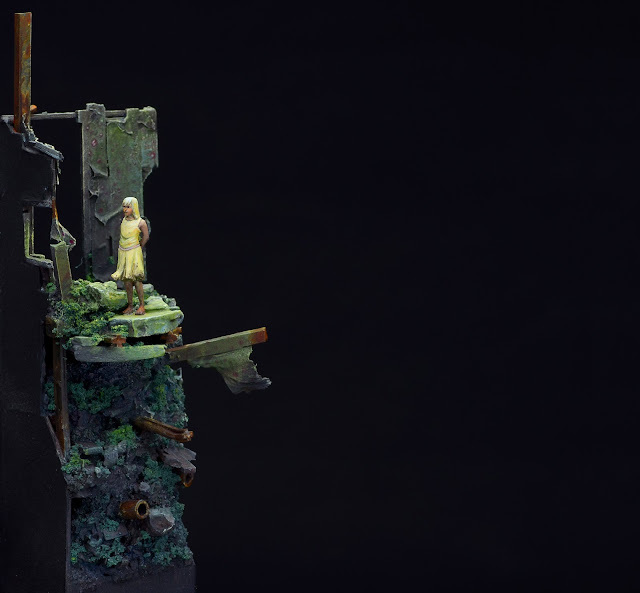 My plan for this model is a very autumnal scheme, and so the forest will be a lot of soft oranges, leaves and debris. 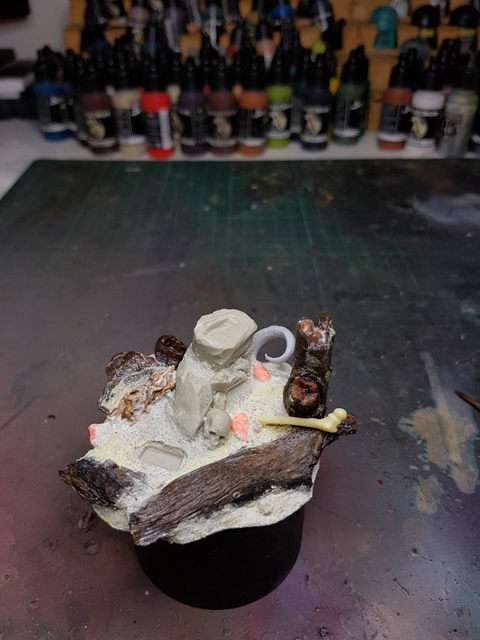 I painted on Vallejo Sandy Paste onto the base to cover some of the Milliput, and add some texturing to the stones and other areas. I also added a horn from a bust by Raffa of FER Miniatures that I had spare, as a rams horn or something. And with that, left it to dry overnight! 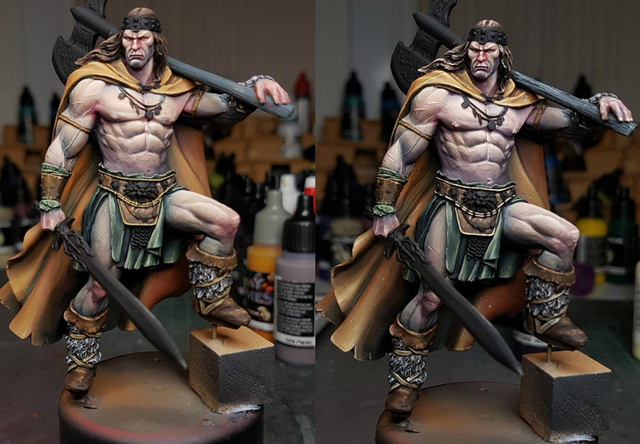 I had airbrushed some really basic colours and shades onto the model, all very desaturated. The plan was to use wet in wet technique to create some colour and interesting volumes to begin with. I added some drying retarder and mixing medium to the colours so that I could spend a bit more time blending and fusing the colours all together. After I mucked around with that, I then used a hairdryer to dry it off, and use some more fleshtone to paint on some highlights. 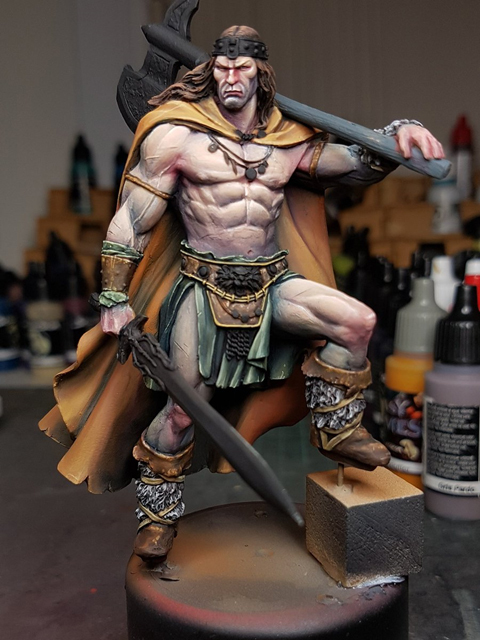 You can see I have already got a lot of volumes in there with the blending and highlights, as well as a few different colours and tones. 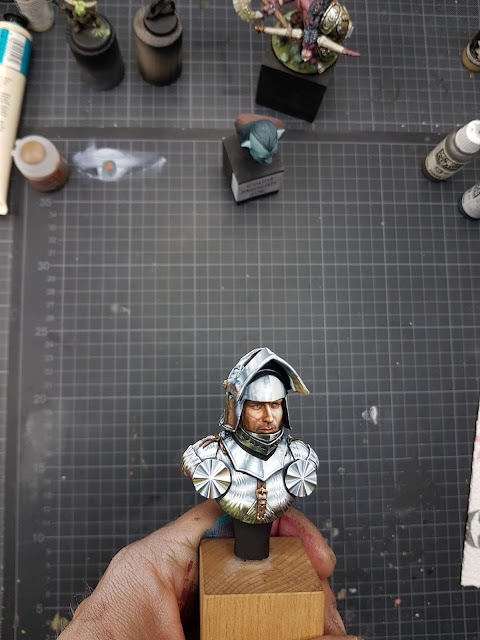 One of the techniques I use I call airbrush glazing, so after this crazy wild beginning, I tone everything back down. But because it reduces the overall contrast, what you see here is not enough contrast. I pulled out a pure white and cream colour and added even more crazy light points. "There are no mistakes, only happy accidents". Sounds amusing, but when you actually start to live and breathe this mantra within your painting, you find yourself with more freedom and creativity. 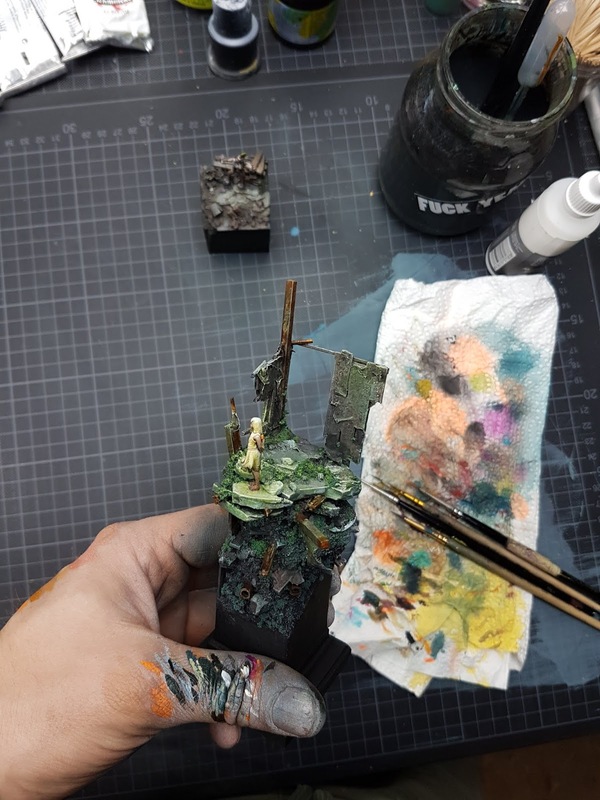 You can always, always fix a bit of paint in the wrong area, or a colour choice not quite right, or a textural mistake or whatever, so why not go crazy and push things and see how it all comes together? 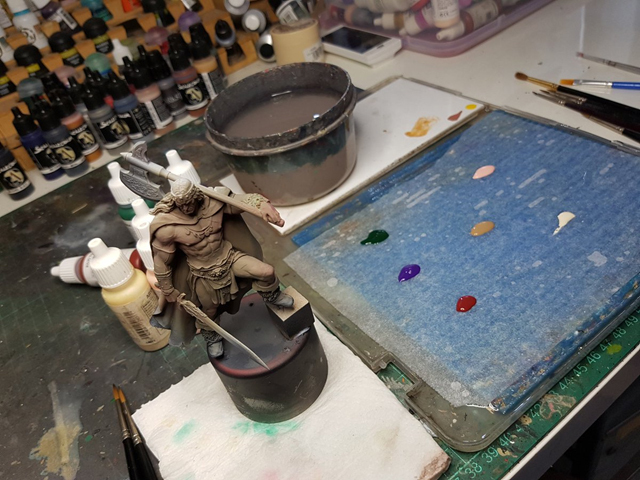 Using my airbrush, I glazed multiple thin coats of mid tone paint over the entirety of the model, softening the transitions and colours and harmonising it all. This is a technique I am using more and more, just in the early stages of my pieces, because I can go crazy large on highlights, knowing that it will be softened. This is what it looks like after I use the airbrush for around ten dilute glazes. You can see the huge difference between the two models, and what is probably most interesting is that to get to that second stage took me all of about five minutes? In fact, this entire process was less than an hour, because I am not worrying about precision and refinement, just actually getting value and tones where I want them. You can see that I need to bring more contrast back in, and add a few more colours and tonal interests. Red on the knees, elbows, nose and armpits is usually where I start, and then some cooler blues and purples in the deep recesses. 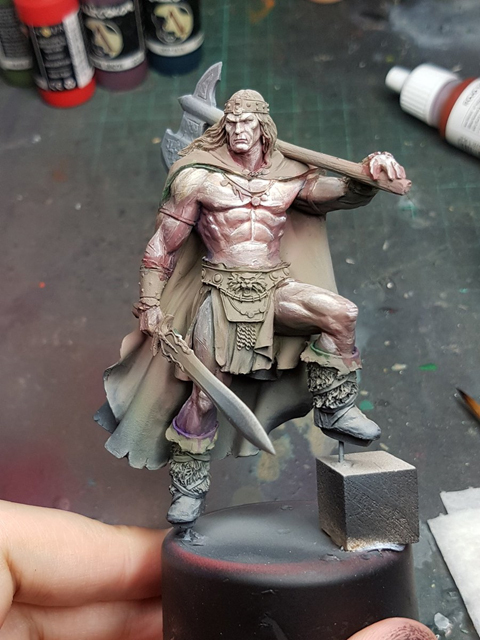 The next step then is block in some of the colours on the rest of the model. It is so crucial to have the rest of the colours at least blocked in, because the contrast and relative value of any part of a model relies on everything else surrounding it. 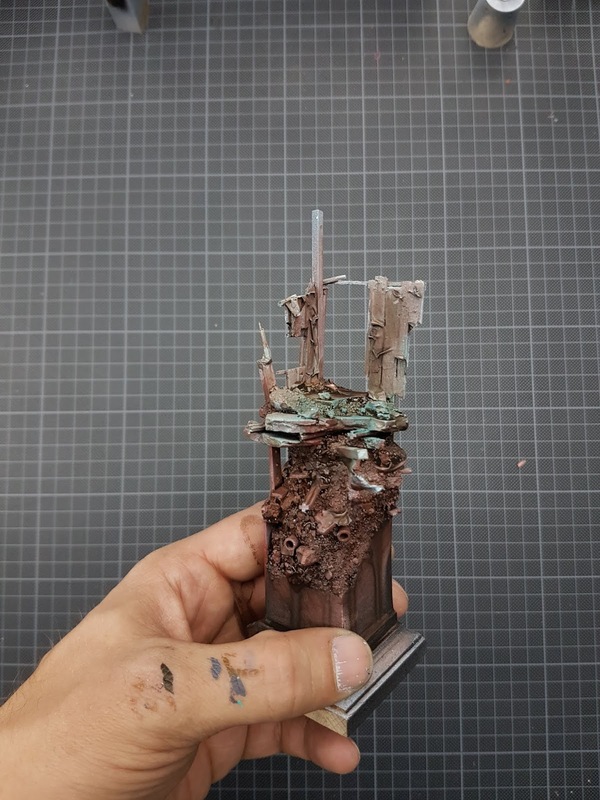 The best example of this is when you paint the edges of a base black. 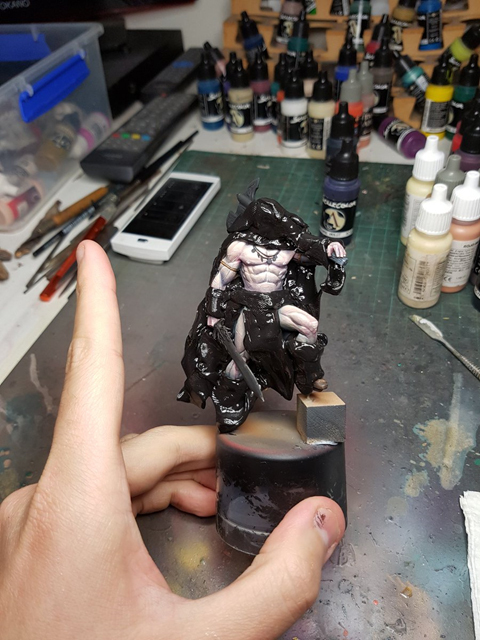 Having the base black makes the model pop more, because the higher value of the painted model is more visible. 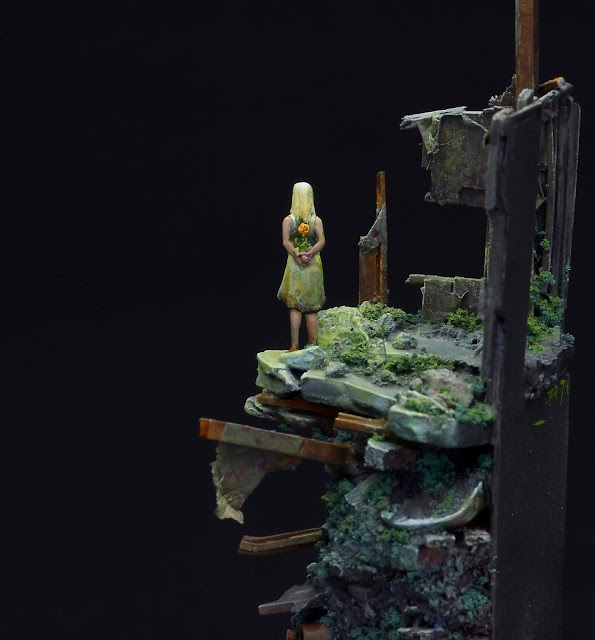 This is also the case with colours on a model. 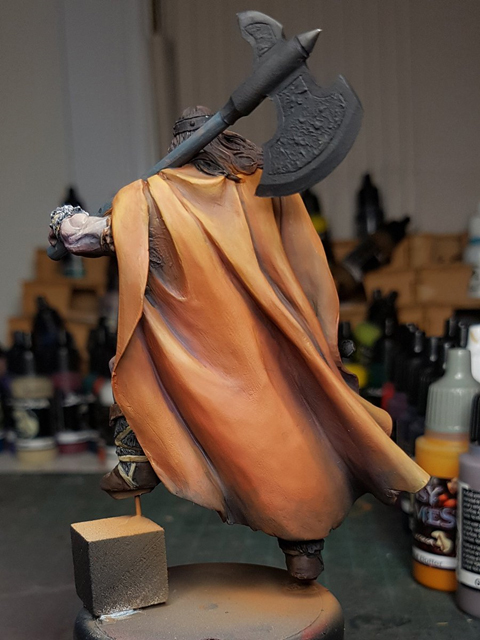 I pulled out my trusty Panzer Putty, covered the skin and then airbrushed an orange onto the cloak. The orange I planned to be like a dry leather, with a bit of texture on there. 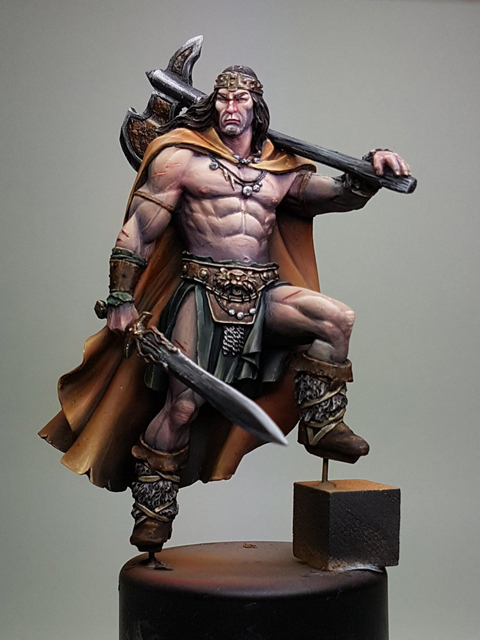 I pulled off the Panzer, painted the loin cloth in blue, the complementary colour for orange, but kept it very dark. Painted the hair, and suddenly the model looked a lot more accurate to what I was going to be ending up with. Another thing that the best painters do which I've been trying to use more and more is shade and highlight with complementary colours. It adds more richness and diversity to the piece, so I started with blue and purple/red to shade the cloak with. I was pretty heavy handed early on, even though the airbrush creates that really nice effect, adding some actual texture is a part of the plan down the track. I painted in some of the browns and leather areas. You can see it is starting to come alive now, as each area starts breaking apart the model. I went back in and worked a bit more on the skin, smoothing the face details and so on. I kept trying to get the balance right between skin texture, smoothness, colour and contrast. It is still not where I want it, but you can see it is getting close. 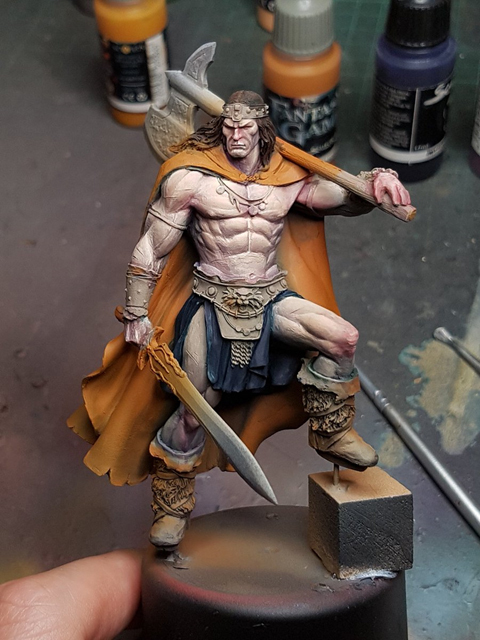 I also mixed in the orange from the cloak, and some ivory, into the blue of the loincloth. This create a really interesting desaturated green, which I used. It still has some of the hints of blue so I think still works with the orange. 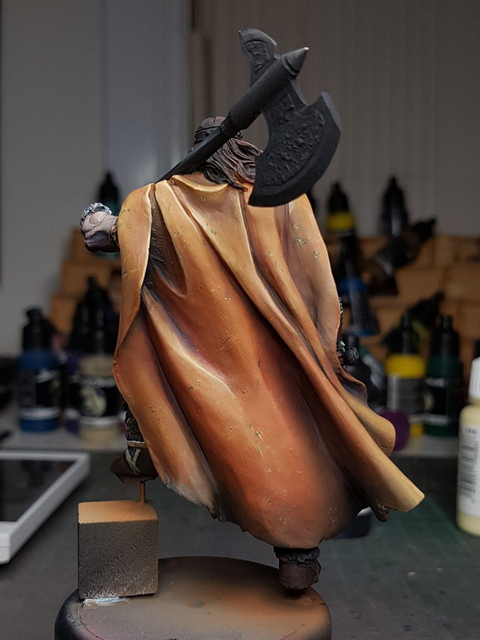 More highlights on the cloak, painting the fur with some more wet in wet work, the leather strappings, painting the leather belt, and getting the skin smoother again, as well as adding more contrast to the lower areas. Looking at black and white photos using my phone, I could see that I need more contrast within the skin itself. I have a large up version of the back of the cloak. I've got a lot of different shades in there, but the highlights are consistent orange, to an ochre yellow. 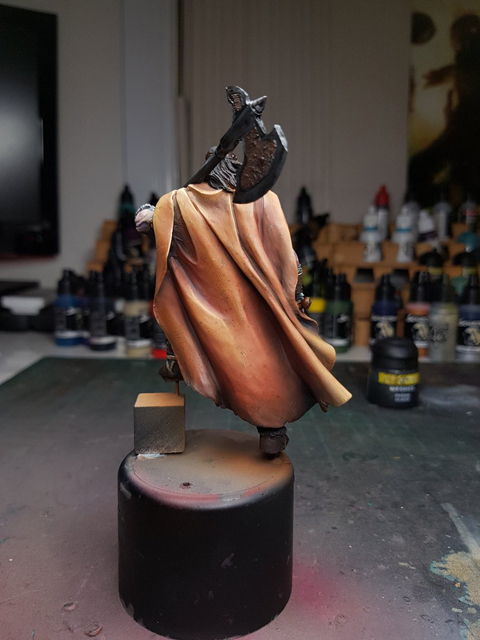 The next stage of their highlights will be a cream colour which should make the cloak pop off the model. I also painted the eyes, a very difficult job on this model as they are inset, and very small. I managed to nail it first time, which I was stoked about. I also added some blue tones to the lower jaw, and a bit more white to his forehead and nose. Moving forward from here, I used really small micro stippling to add to the stubble effect on his jaw, put even more redness into the nose underneath, work on the hair more so it is more refined, added really bold highlights and texture scratches on the cloak, smoothed the torso skin tones out just a tiny bit more, darken up the leathers on the lower half of the model and made the fur even darker, made the straps and cables around the belt ivory, painted the wooden haft and then I am ready to move into the metallics! 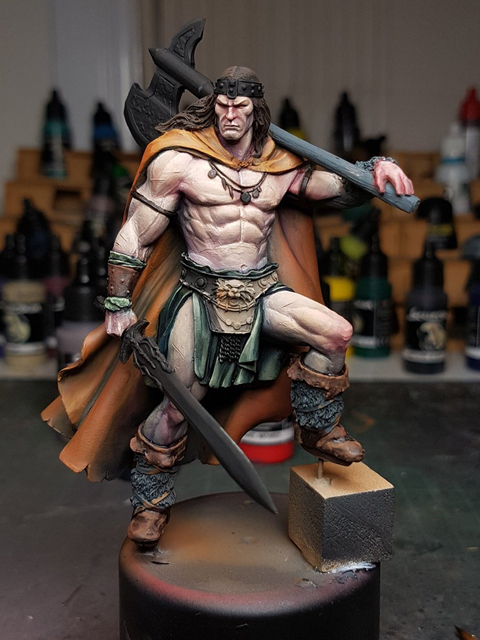 The previous picture showed a relatively clean and solid looking barbarian. Looking critically at the two models, I definitely have more contrast on the model on the right, but the guy on the left looks a little more smooth, and his skin feels a little more alive. The cloak on the right has also lost saturation, gone a little too pale, and I think the hair is far too white. The boots I like the subtle darker shift, driving that intensity up. Overall, the guy on the left looks a little more like he is standing in the sun, the other guy like he is standing in the shade. One thing to keep in mind, the lighting is possibly impacting on these images as well. Based on that issue with the skin looking a little less soft and smooth, I decided to do a few glazes to try and soften everything out. This is ultra dilute, moreso than I would normally do, because I want to keep most of the contrast, but just smooth it all out. I again used Panzer Putty to cover everything but the skin, and went to town! 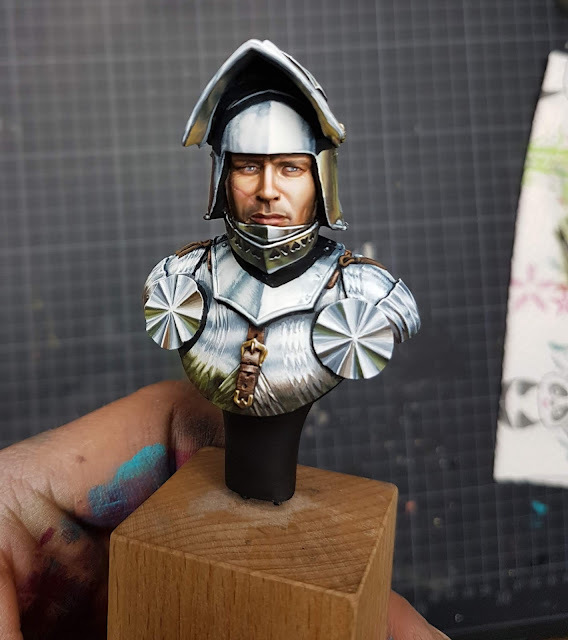 I was much happier with the skin after that, and decided to do a bit more glazing on others areas as well. I pulled the Putty off, grabbed some oranges and reds and hit areas of the cloak. This was to increase saturation, and some oranges to smooth out some of that harshness. 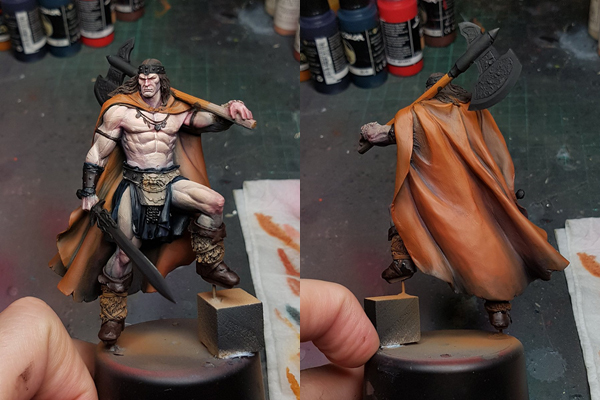 I was happy with the result, so I did a bit more work to the hair, and painted in some base tones for the metallics. You can really see the extra red and orange I've got in there now, and I think it brings it all together a lot more. 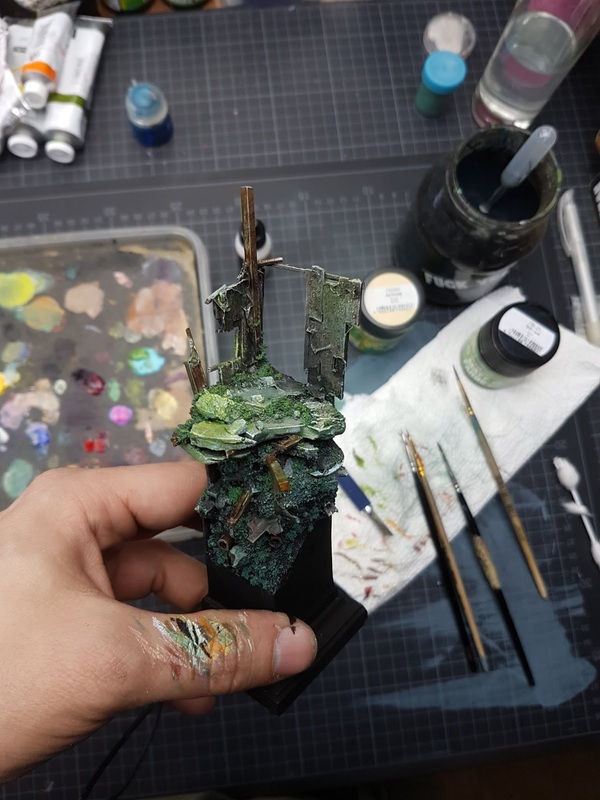 I wasn't worried about bleed over into other areas with the airbrush using red, as it was a very dilute mixture and I was pushing it out at a low PSI. Even if I did get it in other areas a litte, it would just help transitions. I then painted in the crown, the sword and axe and belt. I used a brass colour for some parts, and steel for the others. I tried to put some oxidising on the brass with a little blue, but it was a little overpowering so I went back in a worked with it a bit. I tried to keep the steel areas very dark, with some cold blues in them. I painted gloss on the eyes, Tamiya X27 on the cuts on his body, and a bit in his mouth, and put him up on a proper background to get a really good photo so I could look at it closely. Overall, I was pretty pleased with it. I painted the base, glued the model down, and called it done! I have a number of reflections about this piece All of the colour choices I made reflect nicely the theme I was going for, the scheme has no primary colours and feels a lot more harmonious because of the shading and highlighting colours I chose. Contrast is something I am always considering and trying to get more of, and I think this was one of the first models it started to come together for me. This model has contrast higher up towards the focal point, whereas the lower areas have lower values. I have a good separation in most areas where I have a low value colour beside a high value colour, and overall the intensity of each section from dark the light is pretty solid. 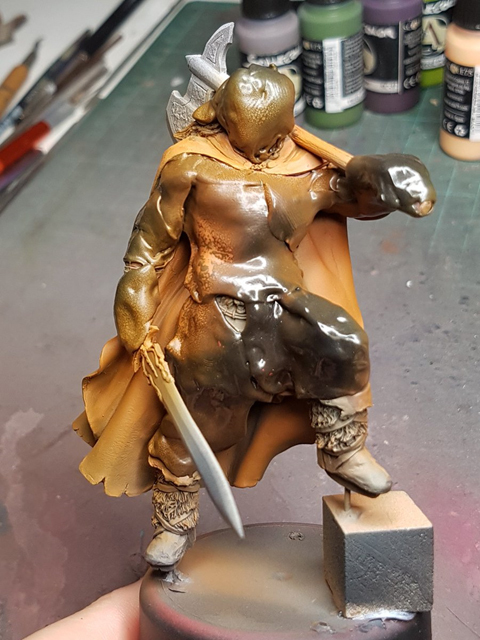 I perhaps needed to consider it a little more with the base, and the cloak colour was maybe too pale compared to the skin. 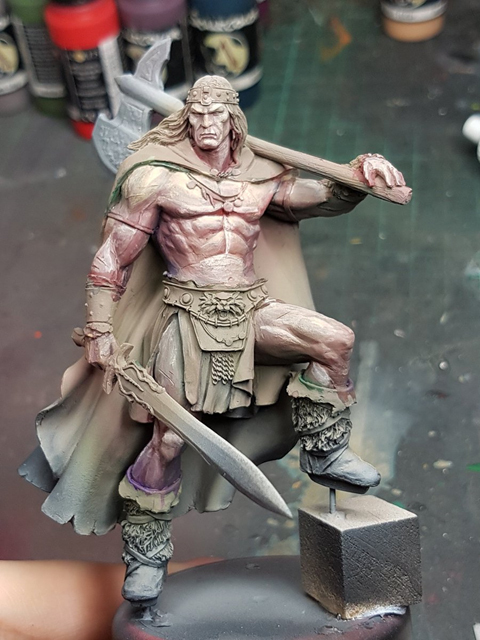 I wanted to experiment with colour in the skin, and across the model, and I think on the whole it was a successful experiment. Looking back, I definitely didn't push it far enough. 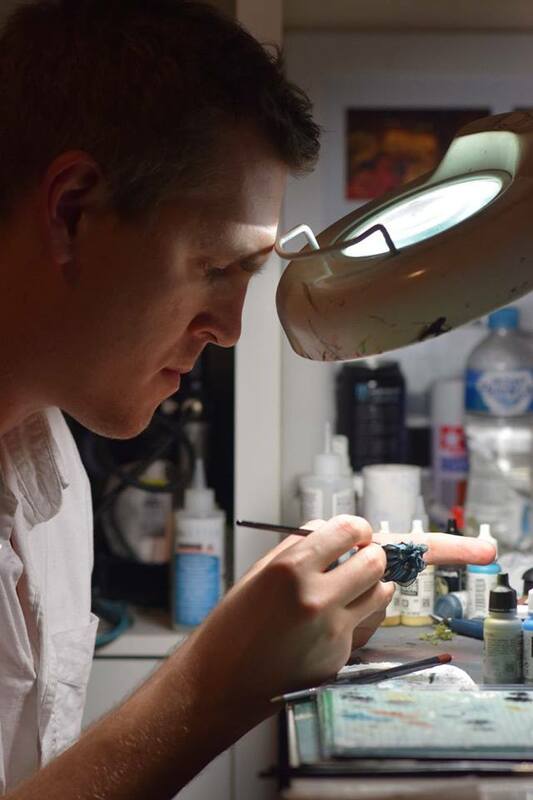 I wanted to go really wild with colours, have lots of incredible tones in various areas, but when I glazed and smoothed areas out I lost a lot of that vibrancy. At the time I painted this, I felt it sat in one of the top three or four models I have painted. 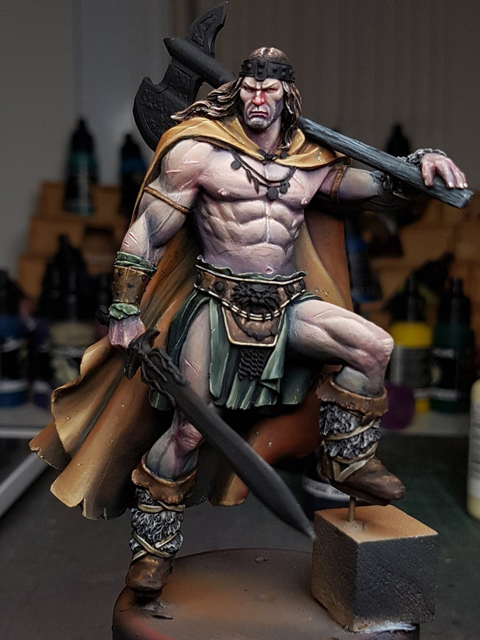 Since this model was painted I have evolved and improved, but as I pen more articles hopefully you will see my progression. ... some weeks back Augsburg was visited by Mr. Kanaev where he thaught a private coaching to a wild mix of students from all around corners. They travelled from Graz (Austria), Hamburg, Augsburg and Wuppertal to enjoy Kirill's coaching on painting. The concept of the coaching was a free ride and every student could ask for his personal topic. Kirill was helping everyone to improve in his very own subject. Additional to the days of the coaching we also spent some nice days in Augsburg before and after this years Duke of Bavaria. Following you can find a small selection of some best of photos. 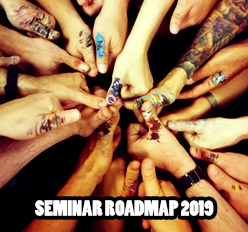 I for my part was not able to attend the coaching as life kept me busy during these days, but it was a joy to organise it and see the students learn so much from the wonderful person, patient giant and amazing artist that is Kirill Kaneav. The Kirill, recieving a haircut at Augsburg's best barber shop! 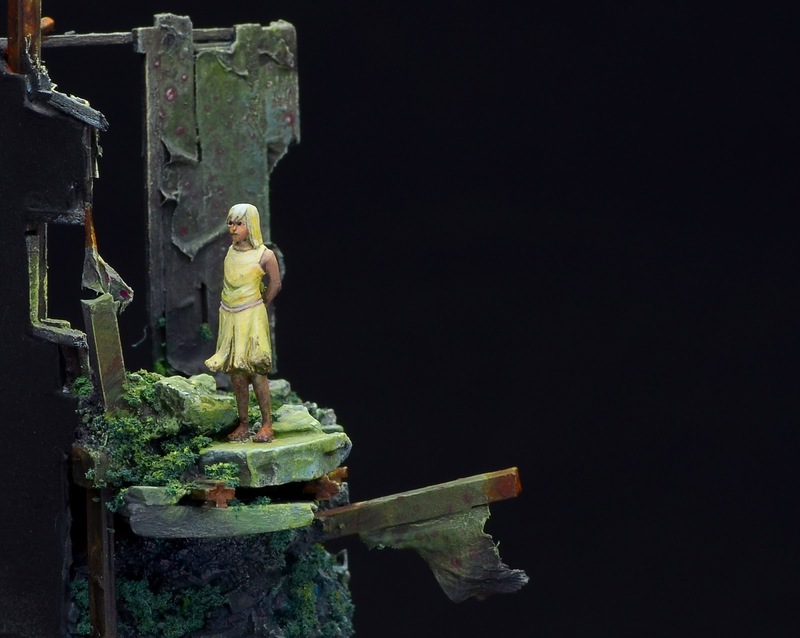 Kirill's work up close in hand is always a true joy! Everybody painting focuses on their projects, Kirill in the middle. Observe nature and learn painting from it. Blurry photo, but still lovely! Some where painting, others had too much fun! :D - More impressions! It indeed was a little family reunion of friends. Would love to have been able to focus more on painting these days to enjoy Kirill's coachings in full force. We want to thank Kirill for coming to Augsburg and being a wonderful coach for the gang of students who showed up to get to learn from his mastery. the jungle of MV is heading towards announcing the MV challenge for 2018. There will be two categories. One more interesting than the other, believe me. Life kicked me in the nuts earlier this year and I put this task far aside as I was just not able to ship the last couple remaining parcels as I had significant other priorities. I am very sorry for this, but it is time to get things sorted out and if you drop me your adress again I get things rolling. Thank you for your patience on this! The jungle never forgets. 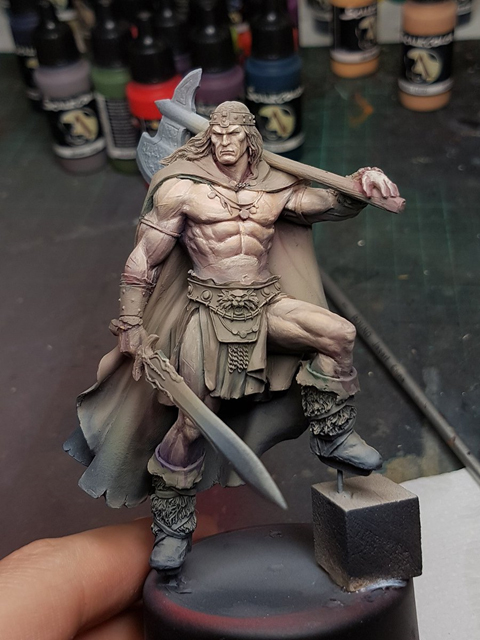 One will subject this great 28 mm sculpt by MV Member Benedikt Sedlmair that will be released next week via Mr. Lee's Minis when we announce the challenge. Stay tuned for it, it will challenge all these brave painters outthere to create magnificant pieces. Roman and Josua did made up their minds to bring you two great categories and even do something good with it. It just was a big organisation whirlwind behind the curtains. holding a flower and all her hopes. Then I checked back where to place Marie herself, but planned to paint her off the base as she is such a delicate sculpt. I used some fine stone sand and hid the cork areas and used some to place in corners for natural looking dirt. As you can spot on the photos above I wanted to create old roughed wallpaper to the balsa wood areas and I did this with thin paper you can buy for rolling cigarettes and matte varnish. Matte varnish is great to fix such elements in place. Superglue or other glues might destroy the fragile elements. Dunk your stripes of paper in matte varnish and place them to the walls. Just like the real thing, somehow. Use a toothpick to push them around as you want them, damage them as you see fit. 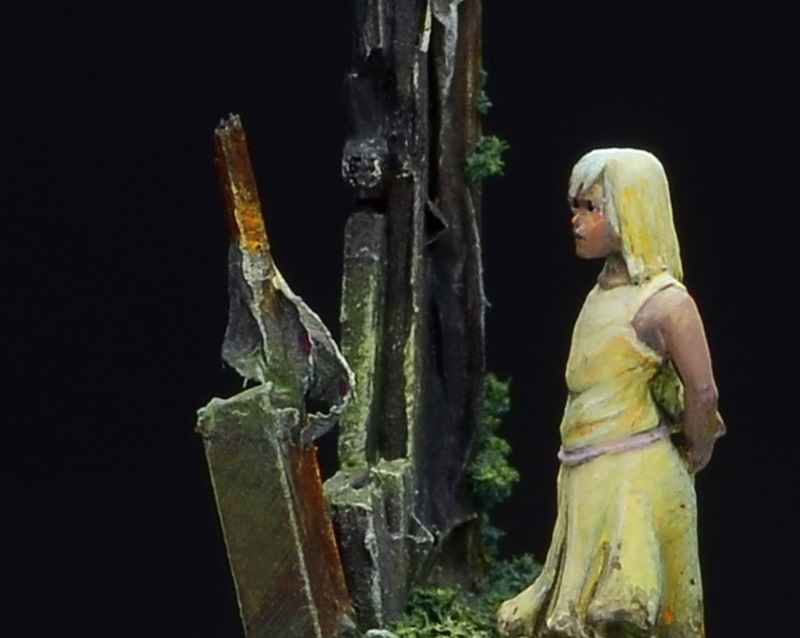 This brings great areas for painting afterwards, where you can play with light and shadow. I started the paintjob rather roughly and used the airbrush to bring in my main color. A little touch of green to sketch in where I wanted to go in the end. I also used this method to create old fabrics in the wind. 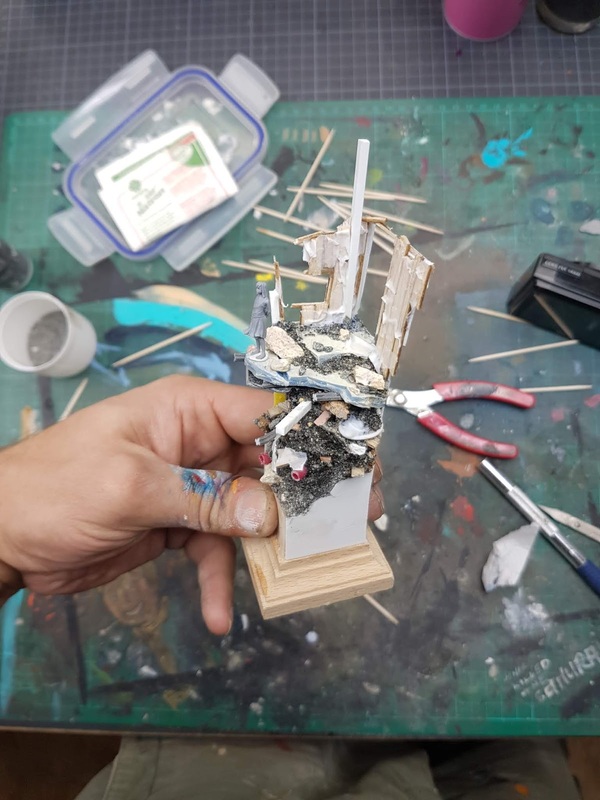 Can you imagine to make miniature newspaper with this technique too? No? 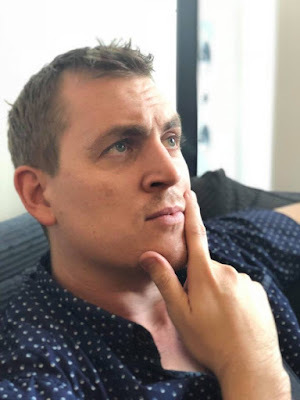 Check this article! 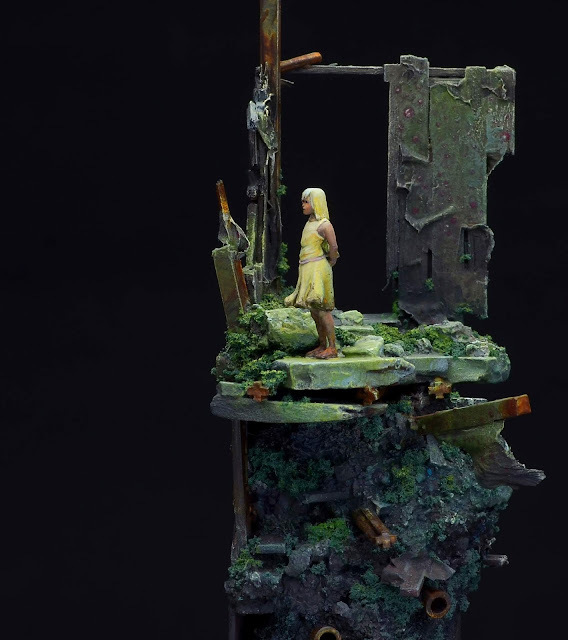 I added some moss to make it look more natural. Just like I did in this cool step by step of "Memories". 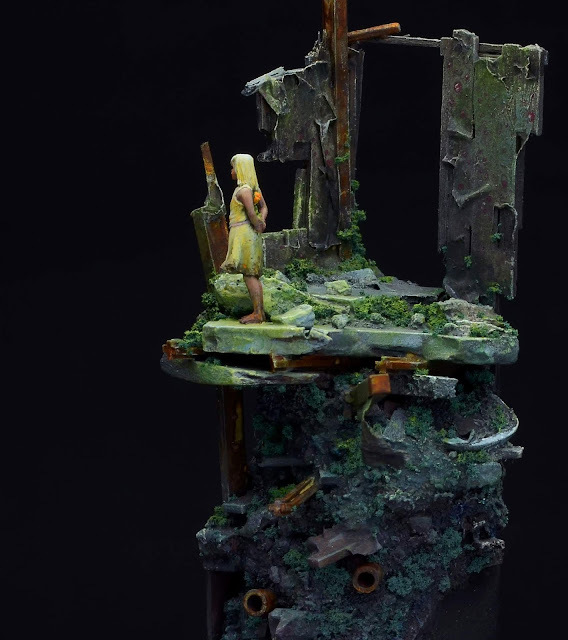 When "Marie" was painted aside I placed her again to the base. I really enjoyed the green turning more warm, yellowish around where she stands. That is why I love green so much. It can give you a warm and welcoming feeling of hope or it can be a cold color too that feels sad. It is just about the amount of blues and yellows in the mix. Using these two options by painting green I was able to tell a sad story of hope. Maybe with a happy end or not. Nobody knows. At least there is hope. If hope dies, everything is lost. I hope you enjoyed the small walkthrough.